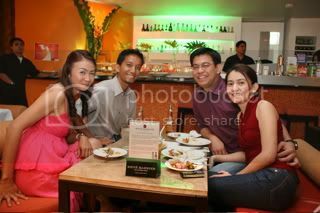 i went to janet’s birthday bash at ñ in rockwell last saturday despite being a little under the weather. i thought i looked horrible, and i even had to walk all the way from powerplant because i thought the restaurant would be there. i felt really bad since the morning that i woke up after i got home from the scorpio night party. as usual, i had too much to drink, and i had this cleaving headache and was having a bout of chills. i upped the drama and called out to my mom asking for TLC. anyway, i still got up from bed so i could go to rockwell, and if i weren’t so sick, i probably would’ve partied some more. in spite of my condition that night, i look really nice in the pics! hehe. i half expected to look like someone under medication. i’ve had this saturday sickness since my return from mindanao. the scorpio night wasn’t as wild as i expected. a few batchmates came and most of the AMCI people opted to stay outside pedro’s warehouse where the air was more tolerable. but some of us did get drunk, nevertheless. i guess we needed people to fire up the dance floor, and the efforts of bitoy and myself were simply not enough. oh well, more parties are scheduled, so there are more opportunities to get drunk and crazy.